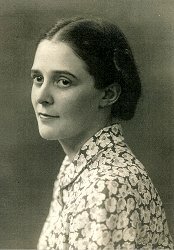 Marié Opperman, née Van Reenen, was born on 19 November 1918 and grew up in Vryheid. She spoke Zulu fluently. Marié studied Sciences at the University of Pretoria (BSc) as it was easier to obtain a position as Science teacher at the time. She was married to the poet Dirk Opperman in 1942. They had three daughters: Heila, Trienke and Diederi. a jolly old-fashioned debate involving notable wits like Professor Charlie Fensham. She was the driving force behind the establishment of a co-educational high school at Stellenbosch. Marié Opperman died on 24th of August 1999. Marié Opperman translated Anderson's Fairytales from Danish in seven volumes, 1963-1968. Some of her children's verses appeared in Die Nuwe Kleuterverseboek by DJ Opperman.